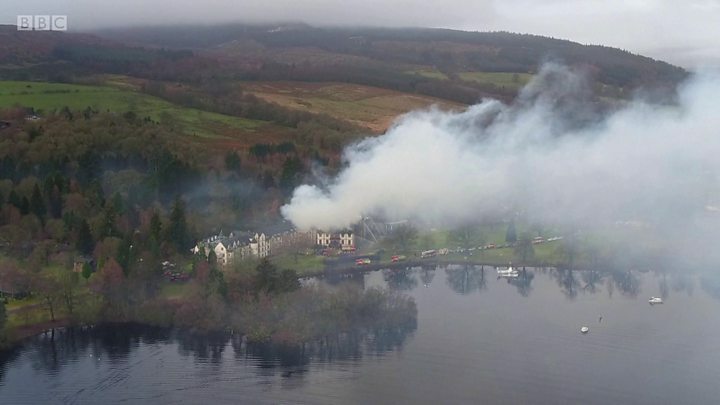 Two guests have died after fire broke out at the Cameron House Hotel beside Loch Lomond. More than 200 guests were evacuated from the luxury resort after the alarm was raised at about 06:40. Police said one person was pronounced dead at the scene while another died after being taken to the Royal Alexandra Hospital in Paisley. A newly-married couple and their young son were taken to hospital for treatment and later discharged. Police Scotland said the hotel, near Balloch, had been extensively damaged. A number of guests were treated at the scene for smoke inhalation. The three people taken to the Queen Elizabeth University Hospital in Glasgow were members of the same family who were rescued by firefighters. Speaking to the media gathered at the hotel's entrance, David McGown of the Scottish Fire and Rescue said: "Unfortunately, and tragically, this has resulted in two people losing their life as a result of the fire. "The fire and rescue service's condolences go out to the people involved in this tragic incident and our thoughts are very much with the family and friends of the two people who lost their lives this morning. "The fire has caused extensive damage to the central section of the hotel. "Our crews have been working tirelessly since 07:00. We have 14 fire appliances at its height tackling this fire and more than 70 firefighters. "As you can imagine, as well as being an absolutely tragic incident where people have lost their lives, it is an extremely complicated incident and fire to contain and will continue to do so. "We will continue to work with partners to bring this incident to a conclusion." Ch Insp Donald Leitch from Police Scotland said work was ongoing to establish the cause of the fire. He said: "Police Scotland were called to Cameron House Hotel where 200 people were evacuated from the hotel which has been partly damaged. "One person was pronounced dead at the scene. Four were taken to hospital where one person tragically died." A guest at the hotel told BBC Radio Scotland how she initially thought the fire alarm was a drill. Ainsley Huxham said: "As soon as we left our room - I just thought it was a fire alarm, just like a practise go. "But when we left - five stairs down from our room - we saw a whole room full of smoke and flames. "So we had to run back down the hall, chapped on everyone's doors and shouted 'fire!'." She added: "We got out within five minutes of the fire brigade getting called. "And by the time we had got outside, the whole field was full of people." Staff who turned up for their shifts at the hotel during the morning were being stopped at the entrance. Much of the interior of the main central section of the hotel, thought to be the oldest part, was visibly blackened, with upper floor windows smashed to allow the firefighters' water jets access to the flames. The Salvation Army were in attendance to provide the emergency services with food and drink. One woman who works in the kitchen told the BBC news website she just heard about the fire as she was getting ready for work. She said she didn't believe the news until she came down and saw the smoke. "It's a really lovely hotel," she said. "I'm so sorry to see this." Stewart King, general manager of the neighbouring Duck Bay Marina, said he had been down to the hotel and was shocked by the extent of the damage. "It was very bad," he said. Guests were sheltered in Cameron House's Boathouse restaurant while the situation was ongoing. Cameron House is one of Scotland's most luxurious hotels, with views across Loch Lomond. The venue offers a romantic location for weddings, a championship standard course for golfers and five-star facilities for guests. The chef Martin Wishart has a Michelin-starred restaurant at the hotel. Cameron House is owned by US investment firm KSL Capital Partners, which was reported to have paid between £70m and £80m for the 132-room property in 2015. A statement on the hotel's website read: "Due to an ongoing incident please be aware that Cameron House will remain closed to arriving guests for at least the next 72 hours. "We would ask all guests and customers to remain patient as we work with the emergency services to establish the extent of the damage and ascertain when we will be able to re-open. "More information will follow in due course." Flags were being flown at half-mast at West Dunbartonshire Council buildings. Provost William Hendrie said: "For something like this to happen so close to Christmas is just too painful to comprehend. "I know the staff at Cameron House will also be devastated and our thoughts also go out to them." Andy Roger, resort director at Cameron House, said the hotel was working closely with investigators to identify the cause of the fire. "The safety and well-being of our guests, employees and neighbours is our first priority, and our deepest condolences are with the families of those affected. "We are working closely with the authorities to determine the cause of the fire, and to provide support to our guests and the families of those affected." Under the ownership of the Smollett family, Cameron House was extended and refurbished a number of times. It was substantially refurbished in 1830 and underwent rebuilding work following a fire in 1865. The mansion house was sold by the Smolletts in 1986 and converted into a hotel. The five star Loch Lomond venue has 132 rooms and is surrounded by 100 acres of woodland. The hotel is a popular wedding venue and houses the Michelin starred Martin Wishart at Loch Lomond restaurant. In all, the resort has five restaurants, access to a spa and a championship golf course. American investment firm KSL Capital Partners bought Cameron House for about £70m two years ago.